For more than 20 years, it has been the express goals of Oxbow to fully restore ecosystem function to degraded and impaired streams throughout Ohio. 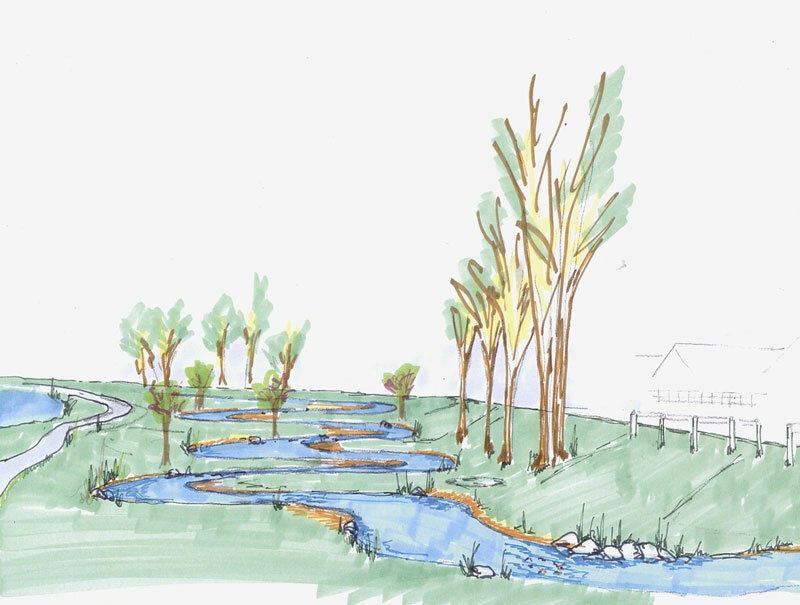 Our definition of “restoration” is to create conditions that return the stream, floodplain and riparian area to at functional state as was prior to disturbance, allowing for the project to achieve ecological uplift to meet the physical, chemical and biological potential and ultimately meeting the aquatic life use potential. Oxbow River & Stream Restoration is a pioneer in stream ecosystem restoration. First, we mastered the design-build method of stream restoration by using an adaptive management approach. This approach integrates the knowledge gained from the implementation experience and outcome to feed back into the next design phase. Oxbow provides projects with that integrated knowledge gained from our experience in the design, the construction, the monitoring and the results of similar restoration projects. Second, we use bio-criteria and bio-assessment to influence our designs including the incorporation of physical and habitat parameters. In 1996, Oxbow began focusing on meeting water quality objectives with Ohio’s streams including the development of restoration prediction criteria based on Ohio’s Water Quality Standards, particularly the Qualitative Habitat Evaluation Index (QHEI). Through consultation with Chris Yoder and Ed Rankin of the Midwest Biodiversity Institute, Oxbow developed a proven method to predict habitat and fisheries improvement using existing QHEI and Index of Biotic Integrity (IBI) metrics. Initial input for this process was based on our experience with construction of specific habitat features and then incorporating that knowledge back into our designs. We have shared this prediction process through a series of training classes given to both private and public entities. This prediction method is used by public agencies such as OEPA and consultants to gauge restoration success. Third, we added nutrient processing to our design criteria. In 2008, in partnership with the River Institute and USEPA we researched the effect of natural channel design on nutrient processing particularly denitrification. This is continuing with the study of how stream restoration activities affect in-stream phosphorus processing. Finally, we use restoration friendly equipment to implement restoration projects. Equipment used in construction of all our stream restoration projects minimizes the construction impact and therefore reduces the risk to sensitive environments. Specialized low-ground pressure equipment reduces soil compaction and damage that ordinarily results in reduced vegetation recovery and soil percolation. This equipment also utilizes non-toxic, biodegradable hydraulic oils to eliminate risk of soil contamination in case of leaks or spills. We consider every project a partnership with the environment and the public. We take very seriously the use of public money to achieve tangible goals on public resources and demand of ourselves much more than just another successful submittal. No one has done more with less in Ohio in this regard. We believe the public deserves the greatest return on the investment and the highest quality restoration feasible. We have been privileged over the years to produce some of the most holistic, highest quality and outstanding projects, all of which have always been within budget and timelines. Oxbow River & Stream Restoration’s experience in providing stream mitigation and watershed scale restoration efforts in Ohio is unprecedented. Dating as far back as 2003, with the completion of the first restoration phase of Powderlick Run, where agricultural influences coupled with the stream’s ditched condition were negatively impacting water quality of the receiving stream. Watershed scale restoration efforts are demonstrated in the Clover Groff Stream Restoration project located in Central Ohio public parks now in its fourth phase and in Crosses Run Stream Restoration Project completed for industrial water quality improvements. Oxbow River & Stream Restoration has developed restoration projects for mitigation since 2002 with the completion of the Woodiebrook Stream Restoration Project. This project re-established a trout fishery. We designed and constructed all three full-delivery compensatory stream mitigation projects contracted to third party contractors for the Ohio Department of Transportation. The first project, completed in 2008, was the Pond Brook Stream and Wetland Restoration Project done as mitigation for impacts during the SUM-8 roadway work. This was followed with recent completion of the Candy Run Stream Restoration project in the Lower Scioto River Basin as part of the Portsmouth Bypass mitigation requirements and the Huff Run Stream Restoration Project completed in conjunction with SUM-76 highway work.